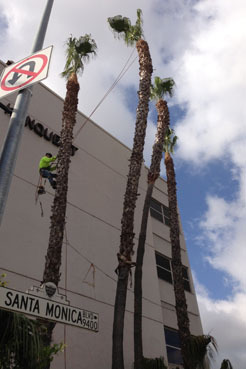 Garden Works has provided the Santa Monica area with tree trimming services for several years now. Find out why Santa Monica prefers Garden Works when it comes to there tree trimming needs. Garden Works offers safe and efficient tree removal by an experienced and caring crew. Extraordinary care is taken for each and every customer. We are well versed with difficult and dangerous trees but also offer competitive service for small trees. At Garden Works we utilize our experience and team work for every job no matter the size. In many cases our crew are required to climb the trees in order to bring them down safely. We understand how to take care of your trees when it comes to trimming and pruning. Santa Monica is our home too and we agree, the trees do look better trimmed. Not all tree companies are qualified nor do they understand the proper techniques required to promote the health and beauty of your trees. Garden Works takes great pride in taking care of your trees. If you do not see what you are looking for in your yard now, please contact us and we will do everything we can to meet your needs. No job is too large or too small. We provide emergency service, 24 hours a day, 365 days a year. Trees can be beautiful to look at, but they can also be ugly and dangerous when not kept in check. Branch out into a cleaner, safer property with tree trimming, stump removal, and other services from our experienced professionals. Do you have trees hanging over your house, pushing against your sidewalk, or blocking sunlight from reaching your room or yard? With 1 phone call, you can have our team at your home creating more space between your home and the trees surrounding it. Are trees getting close to power lines, your home, or your deck? Create more space between your home and your property's trees with terrific tree trimming services from our professionals. Our completion time depends on the trees and the number of trees we're trimming. Other services you might need or want will be listed here. Tree Trimming, Tree Services, Tree Removal, Tree Care, Trees, Garden Service, Landscape Service, Landscape Design, Landscape Maintenance, Landscaping, Sprinkler Repair, Lawn Care, Lawn Maintenance, Lawn Renovation, Lawn Reseeding, & Tree Trimming Service. If you are in need of assistance outside Santa Monica we service 5 diffrent counties.